Home to the oldest University in the English-speaking World, with alumni including some of the biggest names in literature, it is unsurprising that the city of Oxford has copious literary links. Why not head there this Valentine’s Day with your bibliophile boyfriend or girlfriend, to explore the romantic city that has been both location and inspiration for some of the most famous books of all time! No British book-worm’s book-shelf is complete without a collection of the most famous children’s series of all time – Harry Potter. So why not get yourself and your significant other some childhood nostalgia this Valentine’s day and dive into the realms of the wizarding world? 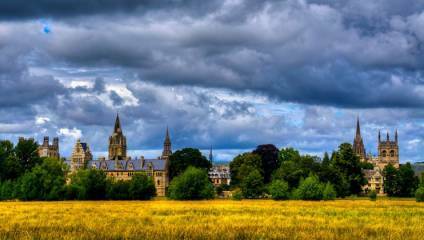 Whilst every true Potter-head knows that Hogwarts is located in Scotland, many of the scenes for the cult Harry Potter were actually filmed amidst Oxford’s grandiose architecture, with Christ Church College being one of the most prominent filming locations. Take a tour around this opulent college – which was founded in Tudor times and has produced 13 British prime ministers – and catch a glimpse of the grand staircase which features in The Philosopher’s Stone and The Chamber of Secrets. Also head into the magnificent Great Hall which inspired Hogwarts’ own Great Hall film set, and keep an eye out for any love potions that might be handy to spice up your date! We all know Alice in Lewis Carroll’s surreal story Alice in Wonderland grew up in Christ Church college, so after visiting her childhood home, head across the street to Alice’s Shop. Originally a sweet shop 150 years ago, the small Oxford store was written into Carroll’s tale Alice Through the Looking Glass, and was sketched twice by Sir John Tennial, the original book’s illustrator. Today, you can pick up a wide range of Alice themed merchandise, and perhaps the perfect last-minute Valentine’s day present if you were running late – for a very important date – from books to accessories, clocks and watches to puppets and puzzles. Big fans of wonderland, will love the Alice in Wonderland themed walking tour run by Oxford Official Walking tours. It’s also combined with the chance to see some key Harry Potter sites, so you’ll get to experience double the magic!